Does combating stigma offend the ‘rights based approach’ in dementia? Let’s for the sake of brevity keep the definition of ‘stigma’ short – but of course it has to be attempted in some way. Stigma, according to the current Oxford English Dictionary is defined as follows firstly. One of the issues about human rights is that you can’t ‘pick and mix’ human rights. You have to take the full package. You can’t buy into some, and not the others. They apply to everyone however. In vogue at the moment is a ‘rights based approach’, but, since mooting the issue, Daniella Greenwood (who is here at the ADI Conference 2015) voiced some concern it could encourage a checklist approach. Checklists are essentially useful, I feel, as the information in them, and can provide inappropriate totality. Like ‘person centred care’ (the phrase that is), the operationalisation and marketing can obfuscate the real sentiment. For example, prior to the necessary legislation, racial discrimination was lawful in South Africa, so Gandhi was the ‘boat rocker’ to use modern NHS slang. There was nothing on the checklist about racial discrimination so notionally it was not a legal issue. Freedom of expression is a human right, article 10 in the English jurisdiction. Along with #JeSuisCharlie and other horrific incidents, there has been further scrutiny of the wider operation of this right. Take for example this, “The Right To Offend? Mehdi Hasan Denies ‘Absolute Right’ To Freedom Of Speech”. “How can you construct a civilised, cohesive society if we go round encouraging everyone to insult each other willy nilly? Yes we do have a right to offend but it’s not the same as having a duty to be offensive. You have a responsibility not to go out of your way to piss people off. I have the right to fart in a lift, but I don’t do it because it is offensive. There are various ways in which ‘dementia’ has become medicalised, which has supported the power of the medical profession over others in discourses, arguably. In the 1960s, warehousing of people with problems with mental health meant that drugs could be easily delivered. “Living better with dementia” in the community would’ve have been unheard of. When Robin Williams took his own life, and who had been diagnosed with a dementia, immediately the potential for media explosion was commenced. This subject combined two taboos – “dementia” and “suicide”. Take for example this Daily Mail article entitled, “Robin Williams’ suicide was triggered by hallucinations from a devastating form of dementia”. Whether someone ‘suffers from dementia’ has been revisited numerous times, and I don’t intend to cover it here. But the starting point, I feel, is that the stigma surrounding dementia goes a long way to explaining why people who have received a diagnosis of dementia don’t want to tell people about the diagnosis: sometimes called “coming out” with the diagnosis, to reflect perhaps a secret that could be hidden. “Mental illness need not define a person as it often has in the past, but we have a long way to go to truly help those in need. Over the centuries, we as a society have ostracized, ridiculed, imprisoned, institutionalized, over-drugged, shamed, blamed, stigmatized and forgotten those who struggle with diseases of the mind. Quite unlike the history of physical ailments — which has had a distinctly different and more promising trajectory. Today we like to think we have a more enlightened view of mental illness, but countless people still fear the stigma of “coming out” with their mental health “issues” to peers and colleagues. How many among us try to hide our own struggles or those of our family members? But is the content of the media something we should take some notice of? Yes – for a start the ADI Conference has language guidelines. Television has the potential to generate both positive and negative effects. It turns out that an individual child’s developmental level is a critical factor in determining whether the medium will have positive or negative effects. Current literature suggests that perhaps physicians can change and improve children’s television viewing habits, or even excessive television watching contributes to the increased incidence of childhood obesity? And interpretation of language is not new. Kate Swaffer, Co-Chair of the Dementia Alliance International and living with a dementia, argued this recently in Dementia Journal in an outstanding paper. So this is a case of ameliorating under-expresssion of information, consistent with the notion that prejudice and discrimination arise from lack of information and/or ‘lack of changing your mind’ when presented with new information. I have seen with my own eyes how the medical profession culturally in an institutionalised way harbour anti-dementia memes like “demented” when talking with other doctors. I’ve been on ward rounds where the Consultant has turned to junior medical staff, with the person with advanced dementia waiting to be discharged after an operation, and said, “But don’t worry about him as he’s got dementia”. We have furthermore to be extremely careful or vigilant that the global policy of “dementia friendly communities” does not promote a sense of ‘otherness’, defeating the prime objective of inclusive. But there’s little doubt in my mind that dementia friendly communities is a valuable concept, even if the nosology isn’t quite right? Danielle White from Alzheimer’s Australia NSW hopes that “understanding of the condition will turn into action”, a similar if not identical to the sentiment behind the UK’s “Dementia Friends” initiative. In a paper entitled, “Dementia Discourse: From Imposed Suffering to Knowing Other-Wise”. 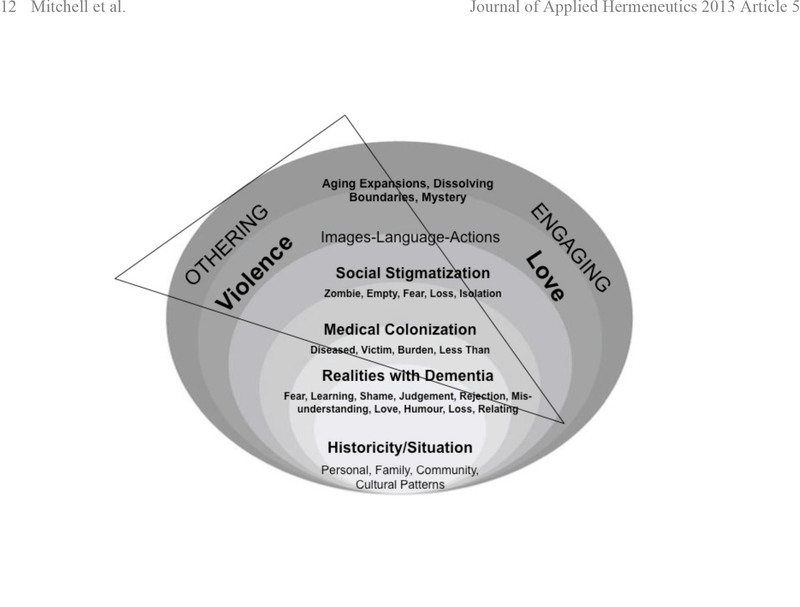 Gail J. Mitchell, Sherry L. Dupuis, and Pia C. Kontos, this intriguing diagram pops up on page 12 which I felt was a useful summary infogram about the ecosystem of a stigma. But we should care about the age at which stigma memes might get implanted. Psychologist Dr Jess Baker has for example in Sydney’s west observed a group of Scouts watching DVDs about dementia. The video forum is part of a UNSW-led project that aims to create a more dementia-friendly society by educating the next generation. Information gleaned from the children will be used to develop an online education program, designed to align with Australia’s education curriculum. .“We know that children are more responsive than adults to anti-stigma education because their beliefs are not as firmly developed,” according to Dr Jess Baker. But the impact of mass media and popular culture should not be underestimated. A group of 11–14 year olds interviewed for a British dementia study made repeated references to the “dementors” in the Harry Potter movie series – half-dead creatures that feed on happy thoughts and memories leaving their victims in a mindless state. First problem – the confusion between depression and dementia. Indeed, some depression might get confused as dementia (or vice versa); but there is a co-morbidity between depression and dementia. Having abnormal emotional responses can be a feature of the frontotemporal dementias. Indeed, Prof John Hodges from NeuRA and Prof Simon Baron-Cohen have both been very interested in how the neural circuitry involved in reading others’ minds might go awry in behavioural variant frontotemporal dementia. source Melissa (30 July 2007). “J.K. Rowling Web Chat Transcript – The Leaky Cauldron”. The-leaky-cauldron.org. In popular culture, dementia is often portrayed as robbing people of their happiness. And of course there are people like me who feel that your “Self” is not “robbed away from you” during dementia. If we ‘go’ with the “rights based approach”, it’s pretty likely we’ll have to take ‘the full package’, which includes freedom of expression conversing with a person with dementia but also a freedom of expression of a person with dementia. Except…. there’s a catch here. If somebody’s acting badly with a person with dementia, it might be ‘freedom of expression’. If the person with dementia dares to say something back, it ends up being ‘agitation’, ‘aggression’ or ‘challenging behaviour’. 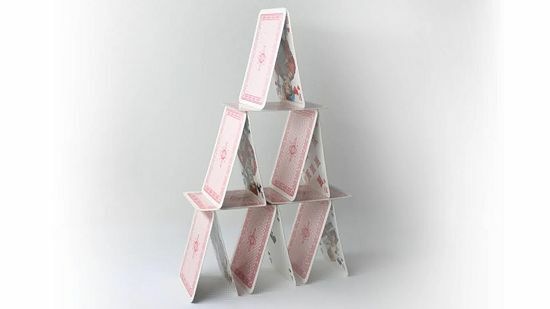 It essentially is a finely balanced deck of cards, where it just takes one thing to make the whole thing come crashing down. Bar-on, M.E. (2000) The effects of television on child health: implications and recommendations, Arch Dis Child 2000;83:289-292 doi:10.1136/adc.83.4.289. This entry was posted in Other and tagged cards, Kate Swaffer, language, stigma. Bookmark the permalink. « Does a focus on choice not inequality fail people wanting to live better with dementia?